Regardless of window type, original components can and should be retained and made functional with relatively simple maintenance. Frequently, stuck or jammed windows are merely a result of paint buildup over the years. Simple sanding and re-painting can resolve the situation. Sometimes windows malfunction due to warping or rotting of wood, which can be repaired or replaced in part. Dirty, clogged channels (which can be cleaned out) or broken (and easily replaceable) sash chains/ropes and other hardware are also common window problems. 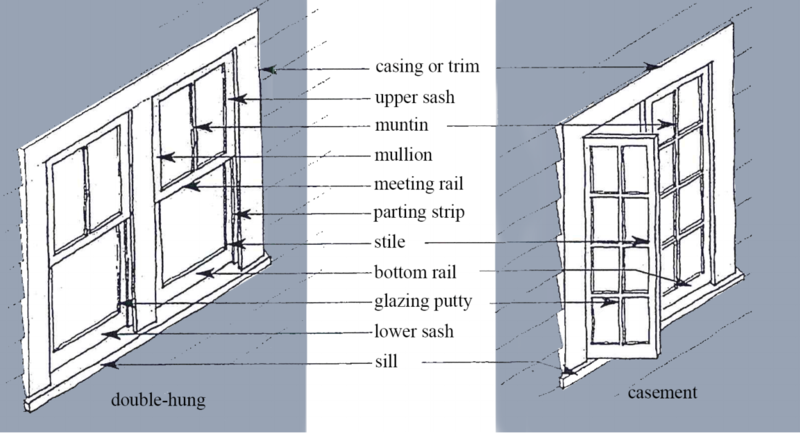 Double-hung: Two sash, one atop the other, opening from the bottom or the top by sliding one over the other. Sometimes the sash contain one undivided pane of glass. In most cases, however, the sash consists of multiple panes of glass, or ‘lites’, divided by muntin bar. The number of lites in each sash of a casement is equal to that of its counterpart (e.g. three by three). With double-hung windows, the number may be the same (e.g. six over six), but in some cases the top sash is divided into more lites than the bottom (e.g. six over one). Casement: One, two, or more sided-by-side sashes, hinged on the sides like doors and opening either inward or outward. Full replacement of windows can and should be avoided. However, if it becomes absolutely necessary, replacement should be done with a sensitive eye. Matching the original design and materials should be considered. Wood, when properly maintained, need not be replaced or covered with vinyl. When in doubt, the material and style of replacement windows should match other original windows in the room or those located elsewhere in the structure. Likewise, scale and placement should be compatible with existing windows, especially in the case of correcting an earlier and inappropriate attempt at restoration/replacement. enclose the outer edges of the sashes. Sill: The horizontal member that forms the base of a window frame (usually wood). Muntin: The vertical and horizontal strips that divide and hold panes of glass. Sash: The operable or movable portions of a window in which the panes of glass are set. Pane/Lite: The framed section(s) of a window filled with transparent material. Channel: The internal upright portion of the window frame into which the outer edges of the sash fit. Sash chord/Chain: Part of a system of pulleys and counter weights, located in the interior portion of the window frame to assist in raising or lowering a double-hung window. Glazing putty: Material that seals between glass and wood.